A recent tweet by a Carleton University PhD graduate, Dr. Jenn Provencher, said something to the effect that Indigenous people are willing to share traditional knowledge, if they think you are willing to learn. She was live tweeting at the Annual General Meeting of the Association of Canadian Universities for Northern Studies (ACUNS) and was sending to twitter a paraphrase of one of the keynote’s, Sen Murray Sinclair’s, inspirational points. So true! For our work on avian cholera in the Arctic, Inuit participation, guidance, and direction was of paramount importance. Collectively, it steered another Carleton PhD candidate, now Dr. Sam Iverson, to many eider duck breeding colonies on islands along the shores of Hudson Strait. I was walking on the weekend when I came across this little amphibian. 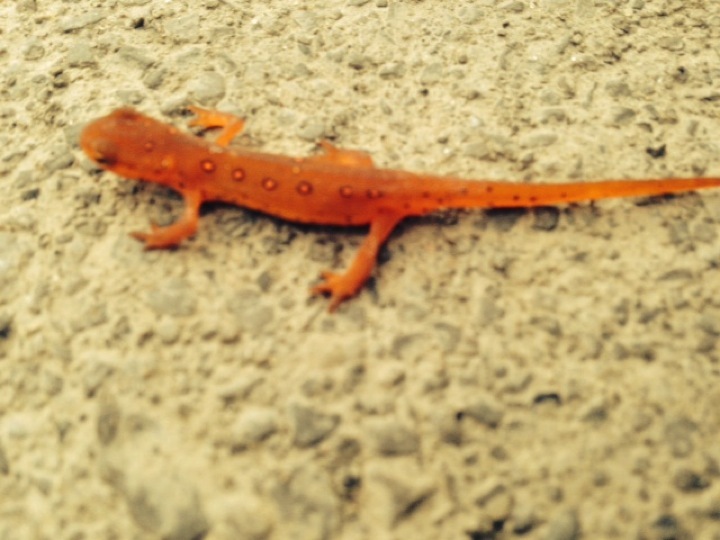 Many of you will have recognized this as a red eft the terrestrial stage of a salamander species common to this neck of the woods (or at least to ponds therein). Recently, Sam Iverson got a lot of press on one of his PhD papers coming from the lab. In brief, polar bears are visiting seabird colonies and eating eggs more and more as sea ice is disappearing. The strength of Sam’s analysis lies in his expanding the geographical extent of what previously was thought to be anecdotal observations. For the full story, click here. Wildlife agencies in Canada and the U.S face a predicament. Migratory Canada geese, which fly to arctic regions every summer to breed, require conservation protection. However, resident Canada geese, which breed in southern Canada and the U.S., often within city limits, are experiencing seemingly out of control population growth. These migratory and resident populations co-mingle during the non-breeding season. In Ontario, and across North America, hunting regulations have been modified by wildlife services to permit hunting before (early September) and after (late February) the traditional waterfowl hunting period. The idea has been that by allowing hunting during ‘special’ seasons, resident Canada geese would be targeted for harvest, whereas migrant Canada geese would be largely spared. In a recently published study in the Journal of Wildlife Management, Sam Iverson (a PhD student at Carleton) and his co-authors evaluated how effective this approach has been. We found that while survival rates of resident population breeding adults have been reduced in association with changes to hunting regulations, a disproportionate amount of the harvest is now falling on reproductively immature Canada geese and other geese unaffiliated with Ontario’s local breeding population. Total Canada goose harvest has more than doubled in the province since the 1990s; however, the increase in harvest has not kept pace with population growth. Most of the additional harvest is occurring during the special early season. Although early season hunting has proven to be a good strategy for minimizing impact on migrant Canada geese it has been less effective than desired for controlling resident Canada goose population growth because most of the harvest pressure has fallen on individuals of low reproductive value. I would venture to guess many of us have witnessed a cat with a dying songbird. Nature’s red domestic. But have we stopped long enough to think about the extent to which our house pets are responsible for declines of songbird populations? What other human activities reduce populations of songbirds and other birds from our (sub)urban and natural landscapes and our agro-ecosystems? There are many such direct sources of mortality including pesticide ingestion, destruction of nest or nesting hens by farm and forestry machinery, hunting the birds themselves, collisions with automobiles, buildings and cell phone towers or windmills and slicking from oil spills. But what are their single and combined impacts? Paul Smith, a research scientist recently hired at the National Widlife Research Centre, has recently been a guest editor, along with Travis Longcore, of an important series of contributed papers on this theme, in the journal Avian Conservation and Ecology.